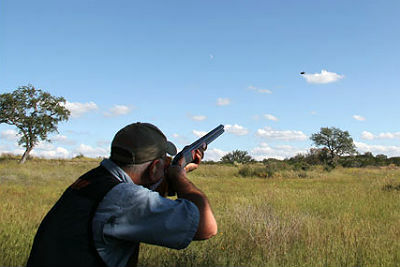 Just about every clays shooter at one time or another will experience a flinch. If it’s happened to you, that first momentarily paralysis of the trigger finger comes as a surprise. If left untreated, a flinch can become debilitating. A flinch can occur from three sources: momentary obfuscation of the target that interrupts the signal between your eyes, brain and trigger finger, repeated heavy recoil when your body anticipates another blow to the shoulder or face from your shotgun, and the noise of a shotgun firing. At first, the cause of a flinch is a physical glitch, but over time your mind takes over, and that’s when a flinch becomes much harder to overcome. Long-term flinching can become so frustrating that some sufferers will simply abandon the sport of clays shooting. For noise-based flinches, get rid of those cheap foam ear plugs and make an investment in high-quality hearing protection. You can get muffs or plugs, but never shortchange your ears in the shotgun sports. When it comes to a recoil-based flinch, the first thing to do is shoot lighter shotgun shells. The velocity of your shotgun ammunition is generally posted on the box. With 12 gauge, if you’re shooting anything over 1,200 feet per second, replace that with shells of 1,000-1,100 feet per second. Better yet, some companies make low-recoil shotgun shells with a velocity of under 1,000 feet per second. Twelve-gauge shooters should consider moving down to a smaller gauge such as 20 or 28. The smaller payloads will decrease the hit to your body. Moving down in gauges does not have to become a permanent solution. If it eliminates your flinch, stay with it for a while and gradually work your back up to the 12 gauge. So-called "gas-powered" semi-automatic shotguns deliver less felt recoil than an over/under or side-by-side by diverting the expelled gases from the shotgun shell explosion into actually cycling the next shell. A universal solution that can help fix a physical or visual flinch is having your shotgun individually fitted to you by a qualified professional. Off-the-shelf shotguns are made to fit the average right-handed guy who stands 5-foot-9, weighs 165 pounds, has a 33-inch arm length and wears a size 40 regular. This diagram shows you the complexity of a proper shotgun fit. If any of these dimensions are dramatically out of whack, they can cause excessive recoil and consequently cause you to flinch. If you don’t fall into that average, chances are the shotgun will obscure your view of the target and/or give you a painful dose of recoil after you trigger the shot. A shotgun meets your body at five points: recoil pad against the shoulder; cheek against the stock; trigger hand on the grip; trigger finger on the trigger blade; and left hand (for righties) on the forend. If all of these points are in proper alignment, the gun should feel comfortable, be easy to swing and allow your eye to form a straight line down the rib for a clear view of the target. Let’s assume that your shotgun fits you reasonably well to the extent that felt recoil is minimal. The next place to address a flinch is your eyes. When you’re shooting a clay target that’s flying at 40+ miles per hour, there is very little time for your eyes and your brain to communicate with your trigger finger to make the shot. Improper eye dominance can send confusing signals to your brain as to when to pull the trigger. Semi-transparent patches, placed on the dominant eye of your shooting glasses, can help shift the dominance to the eye that is looking down the rib of the barrel. Eye dominance can also be a source of your flinch. Most of us have a dominant eye and likewise a large population of clays shooters have a dominant left eye and shoot right-handed. As the target leaves the trap machine, the dominant eye takes over and can send a confusing signal to your brain — causing a short circuit to your trigger finger. All is not lost, however. You can get semi-transparent shooting patches for your dominant eye that shifts the shot to the eye looking down the rib. These shooting patches can be substituted with semi-transparent tape or something like Vaseline. Since clays shooting requires peripheral vision, you don’t want to completely block the dominant eye, only obscure it a little bit. You may find that a patch won’t work for you. At that point, visit your optometrist to see if you need a pair of prescription shooting glasses. Recovering from a flinch takes patience, persistence and experimentation. Eventually, you’ll find yourself back in the groove.